Preparation: Place the empty UNGDiMICKED folder» with a rubber band snapped arouad its length, in your left coat pod--at, and towards, the back of that pocket. The GIMKICKED folder containing the tvo blank cards and with a rubber band snapped around its length is in the front part of the left coat pocket. We suggest that you take the drawing page of these instructions and set them to one side so that you may refer to theta as they are mentioned. 1. Remove the giaaaicked folder with your LgFT HAKD,, with the hinged side to the LEFT, window 'ride down. 2. Very methodically^ and while you continue to talk, reaova the rubber band with the right hand and lay it oa the table. 3« With the help of the right hand, fully open the raider just as you would a book, and with the RIGHT HAND reraove the TCP CARD* using the LEFT THUMB to keep the bottom card la line» so as not to, expose the window» SEE FIGURE ONE. • 5. 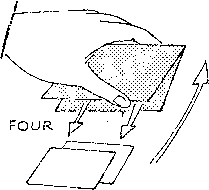 Take the folder in the LEFT HAND.with thcs four finders along the • HINGE SIDE, finger tips slightly curled under bottom flap and with THUMB at the center of open edges-».-palm of left hand down. SEE FIGURE TWO* Now with the help of the right thcsb m.d finders slightly open the folder, loosen the cards by pulling the® away froa tlie hinges a little *fith the -eight ihissb. Let the bottom flap" rest on the curled left finger tips near the hinge. rrith the LEFT THUMB holding the flap open about one qxisrt&r of ^ iuch. SEE FIGURE THREE. ■6. flow with the .folder held in this position-, open edges facing you, and 'with the Xeft finger sails touchiag; 'the table top, -i>tart from naar the edge of " the table and move your - left hand fosfw.rd. rather- shcrply about five or six inches» letting the cards sii£,e out of tfca folder.partly frota the inertia of the forward movement and partly from the -plight tilt that you gave the folder. SEE FIGURE FOUR, Thio is the reason that you ware told to loosen the cards instep number 3. As soon as the cardb are out of the- folder» just crop the , folder where if is (should not be $ver 'fifteen inches1 in front of you). Now turn your attest:' a., to the cat as. WATCH ANGLES CAREFULLY IN ALL THE ".ABOVE. Once you have • tried - the &bove several times'«, you will get tha', '¿si&ck of ' sliding out the cards sad will -be able to regulate the forward jnoveate&i go thft there is • no ' jarkinese or unnatural Hsoveisente. These raovee - were designed to present an apparent careless handling of the folder and yet conceal the window. Everything should be done in m tmhurricd and METHODICAL Fanner. 7. Now turn over each card just once to show without saying that they are blank. Have your subject take either card and tell him to write his question on it. 3. While they are writing their question, you pick up the folder with your LEFT HAND and the remaining card with your right hand. Carefully insert this card into the folder by opening the folder a fraction of an inch and sliding the card in. HOLD FOLDER AS IN FIGURE THREE WHEN INSERTING THE CARD, BUT let the upper right hand corner of the card extend out of the folder about one eighth of an inch. 9. When they have finished writing, open the folder as you would a book and hold it with the left thumb over the hinge at your end of the folder, keeping your card firmly in place under the thumb. SEE FIGURE ONE FOR POSITION OF LEFT HAND. 10. Have the subject place their card writing side down on yours and then with your right hand shift their card so that it is SQUARE with the folder. Your card is under theirs with the upper right hand corner still projecting about one eighth of an inch. SEE FIGURE FIVE. 11. Now you say something to the effect that, you will need a card for yourself. You then grasp your card by ITS PROJECTING CORNER with your right thumb and first finger and, by holding the TOP CARD BACK with your L"£FT THUMB you slide your blank card out from under their card and out of the folder. Drop this card on the table, turning it over as you do so to show it blank. 13. Take the folder in both hands by the short edges, open edges facing you and the hinge side towards the subject. Turn window side towards yourself and METHODICALLY adjust the rubber band to the exact center of the folder, using fingers of both hands in the process. You now have had plenty of opportunity to glimpse the question, and you carelessly toss the folder on the table. SEE FIGURE SEVEN. 14. Now you pick up the blank card and begin to get impressions; give a few false starts and then write something on the card. Actually write an answer to their question and when finished place it on the table writing side down. 15. State that you can't seem to get the complete picture and that it might help if the subject looked at their question again. You pick up the folder in> the left hand, hinge side to your left and with your RIGHT THUMB dig into the folder at the center and slide the question card out about one quarter of an inch. Let the subject grasp their card and slide it out into their hand. Drop folder, on the table near you. Have the subject concentrate on their question as you pick up your card and apparently add a few notes...finally say you are sure that you have it now and hand them your card to read the answer that you wrote. •rubber band around and placing folder back in your pocket. To Prepare: Simply wet the Cap Pad thoroughly'by shaking the bottle, then .-remove the Cap .and place it in your pocket. Just prior to presentation, press the thuab on the Pad within the Cap to moisten the thumb. Presentation: Borrow"foil wrapper any .package of chewing gum. or cigarettes. Then, ask fojr-ybltmteers to try-*,an; experiment in "'Powers of Suggestion'"'. Begin tearing off small, pieces of the foil and crumpling them up into small wads and place it into the palm of volunteer's hands and have them close their fingers over it. (Crumple, do not ball the foil up tightly so that air can get to all of the metal,.- and be sure that some of the Mental Heat fro» the thumb is rubbed on ths metal in the process of crumpling and tearing)... Then '"suggest'1 to. each one as you hand him this-; crumpled foil that he should "Think HOT". In jtss-t a few seconds'he will begin to feel it getting extremely hot and may drop it trow the heatJ As soon as you begin getting responses of "!IT IS hot!'" etc., you continue with comments as, "How, it is getting hotter or ''Try to keep from thinking that it is hot'' etc. . . .This gets good audience response and you may find many others who want to try it for themselves. After about 35 seconds tell the spectators holding the foil to 'Think that it is becoming COLD. Think COLD! and the rapid cooling effect of the Mental Heat on the metal foil will give the sensation of coolness to the metal. This IS ACTUALLY USING the Power of Suggestion! There is no trick to it! For the metal foil only FEELS cool in comparison to it's former heat! But in describing the feeling, a great number of those holding the fcil will describe it as 'COLD". Here is a trick to remember... If the spectator states that it is "still hot", or "getting hotter'1 when yuu suggest that it is getting cold, then tell him to PUT IT IN THE OTHER HMD and again ''Think COLD! and it will turn cold: (The reason for this is that even though the foil may have cooled in the hand, some people continue to have an overlay of heat sensation...And their hand may continue to feel heat in the spot where the foil was held even though it has been transferred to the other hand). You can learn to capitalize on these variations in response by speaking of "differences in ability to concentrate etc. Those who are more responsive getting praise and compliments on their "ability", etc... It is always effective to repeatedly demonstrate the hands empty (by showing, NOT by saying anything about it) when tearing off small pieces of foil so that if you are ever accused of "adding some powder to the foil'"' you can tell them the truth, "Those are actually ashes where the metal became so hot that it really burred'1.,» And on closer examination they will find that there really are holes burned in the foil. Tear three sheers from a pad of paper, one at a time, while saying this. Woolworths have, pads about 3h by 2-i" which are ideal. Fold each of the three slips as follows:- Hold the paper with the narrow end up...fold the bottom end up to the top end...fold the right hand edge over to the left hand edge.,.again fold the newly creased right hand edge over to the left hand edge...this should leave you with a folded slip about 1 and 7/8" by 5/8' . "I am going to ask the gentleman to think of something pertaining to numbers. It might have a few numbers in it, such as a street address, 217 West 18th. A phone number, Circle 6^4570. A year, 189S. An auto license, 5K 4692 OR ANYTHING ELSE. Just so the main portion consists of numbers''. This speech gives you a chance to finish folding the three slips. 'Just write it down and refold the slip '. Fully open a slip and hand it to him. If you hand him a folded slip he may write on the outside of it or merely under one fold. "Now, is there someone I can get to think of a word? You, Sir. ..It might be the name of an animal, a vegetable, a friend's name or any object that might come into your mind' . Open the second slip and hand it to him. '''Write it carefully and impress each letter on your mind. When you have finished refold the slip'7. Turn to the man that wrote che number. Hesitate as if you were looking for some place to keep the slip. At this point we come to the real improvement in this standard effect. It may seem like a very simple bit, but it makes it possible to do the trick under any and all conditions. It makes it easier to do and much more convincing. A duplicate slip is pinned to the lining of the hat, in the same position it might have fallen into had it been thrown In. In pinning a slip in, open a folded slip and pin through a single thickness of paper, then refold the slip so uha: it covers the pin. If you have a hat planted nearby, don't refer to it as your hat. It_ is better to say, "Whose hat? Well, I'm sure he won't mind if we use it". When you ask the gentleman to throw the slip in the hat, it is held crown up. This net onl" , uggests the hat is empty, but it prevents the man from throwing the slip in himself. 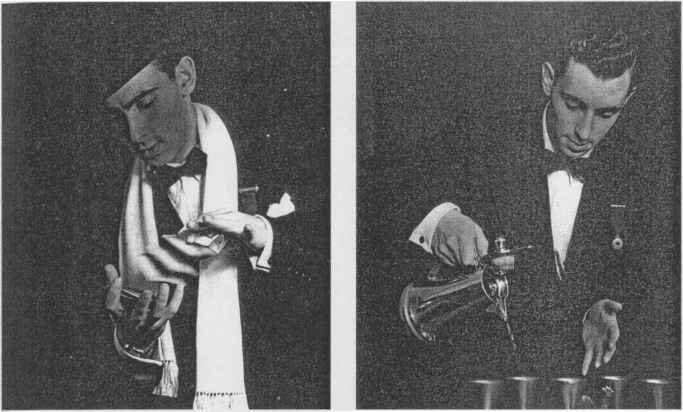 Take the slip from him and turn the hat crown down as you appear to throw in the slip. Let him look into the hat and see that the slip is really there. Whan you take the slip fr on the man, hold it by the end between the first finger and the thumb of the left hand, two-thirds of the slip extending beyond the tip of the finger and running in the same direction as the finger. As you throw the slip into che hat, bend the first finger and thumb toward the pali': and at the same time extend the second finger so that the outer end of the slip rests in the fold of the skin at the first joint of the second finger. Remove the first finger so that the rear end of the slip jumps into the skin fold at the base of the second finger. The slip now rests along the inside of the second finger and is thus hidden. This is just a simple finger palm and is done undercover of the hat. The hat is then put on a chair or the floor --here many can see into it. Turn to the one who wrote the word. ''la'-e you finished, sir? Throw it in the hat yourself.. .Now, who can we get for fhfi picture?^. Pick ap the third folded slip. ''This gentleman over here" . This third blank slip is changed for the first one, the one with the number, which you still are concealing under the second finger. There are many fine, switches for doing this; if you have your own pet switch, use it. This is the one I use.,.Sxecutc the same move you used in throwing the first slip into the hat, except the blank thir.d slip is gripped by the third finger instead of the second. The first finger and thumb then pick the first slip off the second finger and bring it into view. '"I want you, sir, to think of some simple picture '. Open the slip...this is the one with the number...but do not try to read it just yet. '"Now, I don't want you to draw anything with a lot of scratchy lines or fancy shading'■. "I wan": soma picture that is made, up of definite lines ". Take another GLANCE if you didn't get it all the first time. Refold the slip. The refolded first slip is changed back again for the blank third slip. Here is my switch: The blank slip is still being gripped by the third finger, the number slip is held the same as before, betx^aen the first finger and thumb, As I toss the slip to the one who is to draw, I bring the number slip on to tha second finger and at the same time lot the blank fly out from the third finger toward the spectator. Tha move is done on the throw. Reach into the hat with your right hand and remove tha second slip, the one with the word. Ycu can't get the wrong one because there is only one loose one there. "Who wrote the name? No, wait, this is the number. This number has something to do with an amount of money. Is that right, sir? You are thinking of twenty twenty-one dollars and some cents... the exact amount is twenty-one dollars and f if ty''. Start to open the slip so that it will be completely opened when you finish the test, but don't Ic-ok down at it. Glance down at the word now as though you were merely looking at the number to see if you were right.. Let us say the word was NOTRE DAME, IND. 'Twenty-one dollars and fifty-six cents. Right to the penny". Refold the name slip and change it for the number slip which you have finger palmed. 'Perhaps you'd like to keep this for your scrap book. Has the art department finished? Fold it up and throw it into the hat"
Reach into the hat with the right hand and remove the picture slip which has just been thrown in. Start opening the slip the same as before. "You are thinking of SOUTH BEND" Look down and see the picture. "NOTRE DAME, INDIANA. That's bad. I missed that one by two miles" Refold the picture slip and change it for the name slip as you toss it back. "You can keep that one to remind you that there is such a thing as a failure". The fact that you didn't know it was NOTRE DAME until you looked at the slip, throws them off the idea that you are using the old one-ahead method. They also figure that if you had seen the slip before you couldn't have made that mistake. You call it a failure, but you'll get plenty of credit for knowing it was a. town and coming within a few miles of the place. It looks more like real telepathy than trickery. Be sure to use this stunt of being a little bit wrong and not discovering your mistake until you read the slip. It is a great throw off. "Well, Iva got one more chance to redeem myself...Now pictures are hard to describe, so I'll ask you, sir, to take back your masterpiece'. Pick up the hat v/ith the left hand, fingers inside, and allow the finger palmed slip to fall in. Turn the hat upside down allowing this slip, the picture, to fall out into the hands of the spectator. Throw the hat to one side or put it back on your head you have been wearing it. "Show it to those around you' . For large groups have him recopy it on a slate. You draw on another slate.